Canada and the United States are similar in terms of the species of wildlife that mingle freely across their shared border. Despite this similarity, however, there are significant differences between approaches to wildlife management in these two nations. 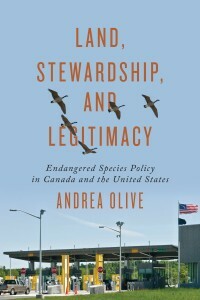 In Land, Stewardship, and Legitimacy, Andrea Olive examines the divergent evolution of endangered species policy on either side of the 49th parallel. Examining local circumstances in areas as distant and diverse as southern Utah and the Canadian Arctic, Olive shows how public attitudes have shaped environmental policy in response to endangered species law, specifically the Species at Risk Act in Canada and the Endangered Species Act in the U.S. Richly researched and accessibly written, this is the first book to compare endangered species policy on both sides of the Canada–U.S. border. It will appeal to students and scholars of environmental policy, politics, and ethics, and anyone interested in current approaches to wildlife management.